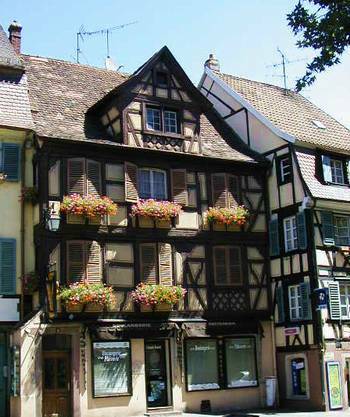 At left, another cute house in Colmar. 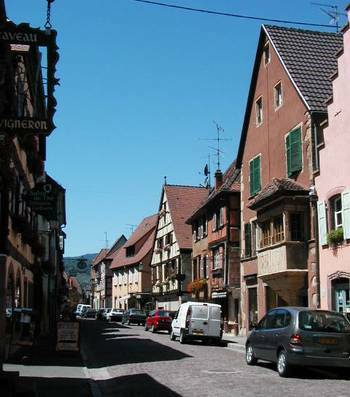 Turckheim is a former Imperial free city (1354) that still has some of its city walls and three gateways named "France," "Brand," and "Munster." We had lunch there in an unassuming outdoor cafe called l'Homme Sauvage (Wild Man). Tom and one of our friends had a traditional Alsatian dish called Choucroute - charcuterie and sauerkraut. Our other friend and I had a French dish that I know well and love - supreme de volaille (chicken with a white wine cream sauce, except this one had a white wine cream sauce made with clams - very interesting). It was normal, not gourmand. I don't think I can eat another gourmet meal for a while. Our dear, wonderful friends bought us a bottle of Alsatian Pinot Noir Langehald in Turckheim. 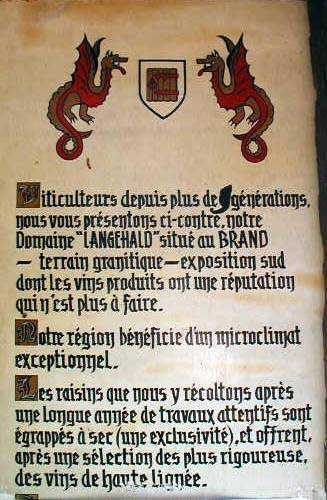 It is a 1999 Sang du Dragon (blood of the dragon) Francois Baur. I haven't tried it yet, but I know from the pinot noirs we had in Alsace that I will like it. 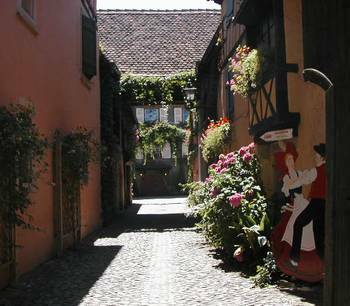 This sign, at left, is outside the Sang du Dragon Francois Baur shop in Turckheim. It tells us that they've been winemakers for generations. 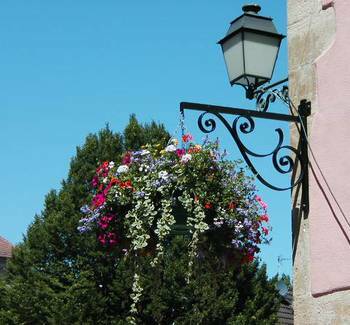 Their domaine "Langehald" is situated at Brand, on granite terrain, with a southern exposure. Their wines benefit from an exceptional microclimate and their products have a reputation that is difficult to match. They work hard and diligently all year to raise good grapes, and due to their rigorous selection, the wine they produce is of extremely high quality. 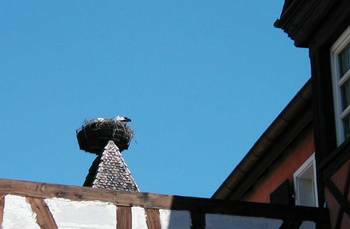 Atop the roof near one of the gates into Turckheim is a stork nest. I've attempted to photograph it, and the results are above and below, left. Our dear friends drove us back to Strasbourg after lunch, and deposited us safely at the train station before they started their drive back to Germany. They've done this for us twice now - last year we had a weekend in Champagne country with them, and this year it was a weekend in Alsace. In my adult life, I've never before had the pleasure of weekends of sightseeing for which I had to do none of the planning. They are truly good, generous friends. The train trip back was quiet and uneventful until shortly before we reached Paris. When Tom and another man from our compartment were out, looking for the restroom, the woman in our compartment asked me if I'd help her with her luggage, which was on the overhead rack. Because of my lack of finesse with French verb conjugation, I thought she wanted help right then and I got up and said "bien sur," that yes, I'd be happy to help. She explained that she meant when we get to Paris, not now, but that started it. She had lots of questions. She asked me if I spoke French. I said that I read French very well but don't speak it very well. She asked where we were from. She thought we were English maybe. She thought Tom was English or French. I explained that we come from Florida. She was astonished. "You are AMERICANS???" She went on to explain that she knew all about Florida because thirty years ago, she and a friend briefly had a condo in St. Petersburg Beach (which we call St. Pete Beach, but I didn't tell her that). 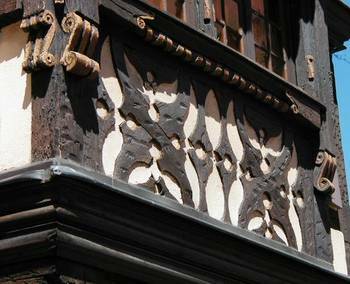 Tom and the young man returned to our compartment and all four of us got into a discussion about French food, compared to American food, about Alsace, about Paris, and about the 15th arrondissement, where the woman also lives. 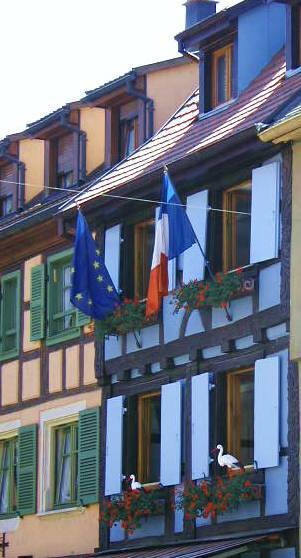 The young man was from Colmar, in Alsace, and he was charming. We think he may have been in the military, and was on his way into Paris to march in the Bastille day parade the next morning. The woman considered herself to be an expert on America and the American diet, but her data was outdated and skewed. We just listened to her, and didn't correct her really at all. In Paris, we easily slipped into the metro and found our way home to the 15th. We carefully selected our metros so we'd end up at Place du Commerce, where even on a Sunday night we know how to get a good dinner. At Della Piazza, we had escalope de veau Normande and haricots vert, which came with lots of garlic, butter, and finely chopped sun dried tomatoes. By the time we got back to the apartment, it was nearly midnight. 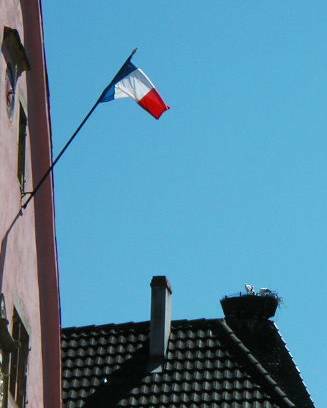 In the morning, we watched the Bastille Day parade, and all its military finery, on TV. That was followed by the traditional hour-long interview with President Chirac, always very interesting. This time he spoke faster than last year because he was trying to cover all the many things that are troubling the French this year - strikes, reforms of the retirement system, schools, the economy, Iraq, Africa, immigration, and so on. Then there were hours of exciting coverage of the Tour de France, and its final stage in the French Alps. We saw Beloki fall in front of Lance Armstrong. Beloki's tire blew out on the rapid descent on very hot pavement. So dangerous. But Lance is still in the yellow jersey. We're waiting to hear about Beloki's condition. It didn't look good. It is VERY hot here, and almost no place is air conditioned. The apartment certainly is not air conditioned. It was in the low 90s yesterday, and will be even a little warmer today. I felt sorry for all those military types in the wool uniforms in the parade. But that was in the morning. The afternoon and evening were really hot, hot, hot. We found dinner yesterday at the North African restaurant, Le Tipaza, on Emile Zola, very nearby. It is air conditioned, thank heavens. Maybe we'll go there tonight, too. After dinner, we walked with the throngs of people flocking to the Champ de Mars for the fireworks. It was only about 10PM, and the fireworks would not start until about 11:30. Thousands and thousands of people were finding their way through our neighborhood. We turned around at the Champ de Mars and returned to our apartment, where we can watch the fireworks from the rear windows. 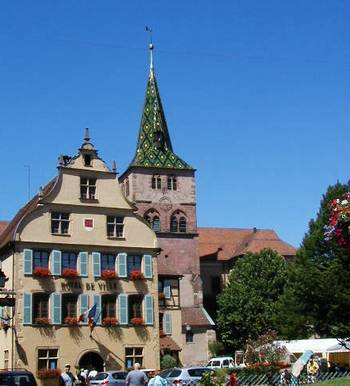 I should mention that I also spend a couple hours yesterday getting these photos from Alsace ready for the web journal. It takes a lot of time to select, edit, crop, resize, and otherwise deal with the photos. I took lots of fireworks photos last night. Later today, I'll see how they turned out, and perhaps tomorrow I'll share them with you. But for now, it is time to upload, sign off, and cool down.